The Neo Air for Iwata miniature air compressor is compact, portable (weighing less than a pound! ), reliable and quiet. The Neo Air is the lightest and most portable option for providing air to fine Iwata airbrushes, such as for nail art, cake decorating and model painting, or for working at low pressures, such as for cosmetics or body art. It works with most gravity-feed airbrushes. The Neo Air is suitable for home, mobile or occasional use. To protect the motor, the Neo Air compressor will automatically shut-off after 10 minutes of continuous use, which avoids accidentally leaving the compressor on. It may be used for a session of 30 minutes continuous use. If you need a compressor for heavier use, please see the Iwata Studio Series compressors. Consider upgrading to the light and portable Iwata Ninja Jet or the Iwata Silver Jet, which is only slightly larger and slightly heavier than the Ninja Jet. For only a small difference in price extra, the attractive Silver Jet is a little more powerful and has the advantage of a built in air pressure gauge and it comes with a moisture filter. 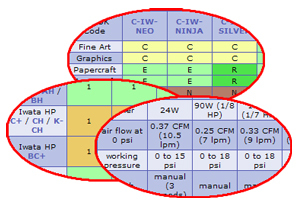 The Neo Air is equipped with an Automatic Bleed Valve. This lets the motor run when the airbrush trigger is not depressed. It features an On/Off button with 3-speed control: Click 1 – Medium setting/Purple Light, Click 2 – High setting/Blue Light, Click 3 – Low setting/Red Light, Click 4 – to turn Off. Compact and portable – weighs less than a pound! Working pressure from 1 psi to 15 psi. 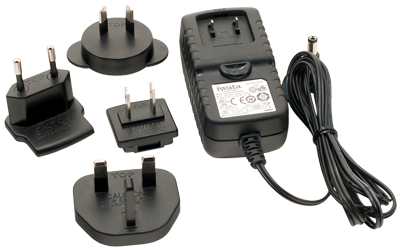 Universal AC adapter with international plugs. Duty cycle: 30 mins (3 x 10 mins) continuous use. Please allow the motor to rest for at least 20 minutes after each cycle of continuous use. This compressor will automatically shut-off after 10 minutes of continuous use to remove the risk of accidentally leaving it turned on due to its quiet motor. 10 minutes is not the duty cycle and it may be turned on for a second and third period of 10 minutes for 30 minutes continuous use, before having to allow a cool down period.